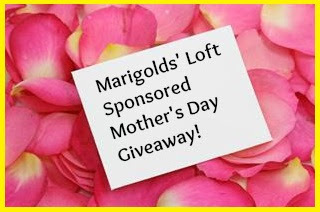 Marigolds' Loft: Sponsored Mother's Day Giveaway! Make this Mother's Day unlike any other! I would like to offer something extraordinary this Mother's Day. There are many cash Giveaways running out there, but I would like to make a Giveaway with a difference. I am looking for some wonderfully talented people out there, those of you who create patterns, are knitters and crocheters, any craft blogger who would be interested in helping me get this event off the ground. What would you have to do to take part? The Giveaway will include a Cash Gift as well as a Pattern Pot - which depending on the size of the kitty will be offered to between 1 and 3 winners. All money collected from sponsors will be entered into the Giveaway! I am only offering 10 Sponsor spots for this Giveaway - You can be included with as little as a pattern or a $5 Paypal Gift. You will get the extra exposure from all of the other sponsors and myself who will spread the news through the social web! To grab your spot for this event, you will need to fill in this form and get it off to me asap. I will close the entries as soon as I reach the 10 person limit or on the 2nd May which ever comes first. I can't wait to see what we will have to offer - I hope you are just as excited as I am?